In the early ’90s, he played with Chris Hillman in the Desert Rose Band. There are many reasons Buck Owens and his Buckaroos were the hottest band in the world in the 1960s, but one is certainly Tom Brumley’s magically graceful touch on the pedal steel guitar. And as you’ll hear on this album, he’s also a fine Dobro picker. 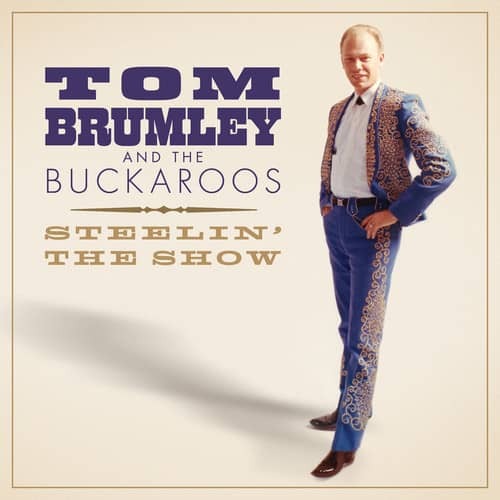 Steelin’ The Show showcases Brumley’s skill and innovative playing by collecting 17 tracks from 9 releases from Buck and The Buckaroos, including “Together Again” that features Tom’s peerless solo—one of the most famous pedal steel guitar breaks ever recorded. Not just a perfect primer for the uninitiated, but also a fantastic aural journey for fans—Steelin’ The Show features an introduction from Tom’s family Rolene, Tommy, Todd, and Tracie Brumley as well as photos from their personal family collection. Randy Poe, the co-writer of Buck’s acclaimed autobiography Buck ’Em, contributed liner notes. "Tom Brumley And The Buckaroos"
geb. 11. 12. 1935 in Powell - Missouri Der Steel-Guitar-Virtuose Tom Brumley, Sohn des Komponisten Albert E.Brumley, der so bekannte Songs wie ,Turn Your Radio On“ und „I`ll Fly Away“ geschrieben hat, traf nach seiner Militärzeit in Deutschland während einer Aufnahmesession in Kalifornien mit Buck Owens zusammen, der ihn 1963 für seine Band, die Buckaroos, engagierte. Tom Brumley blieb einige Jahre bei Buck Owens und schloss sich dann der Band von Rick Nelson an. Customer evaluation for "Steelin' The Show (CD)"